A set of armor that suits the play style of a tank, is the key to success. There are several useful sets around. Because many skills of the dragon knight are using magika, I’m using five parts of the seducer, because it boosts magika regeneration and reduces costs of magika based skills. My weapon was created with the „defending trait“, to further increase my resistances. 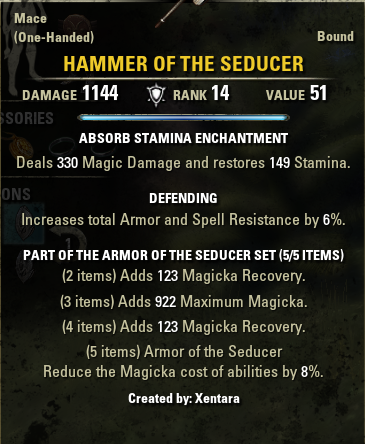 To fill up my stamina pool, the weapon has been enchanted with an absorb stamina rune. 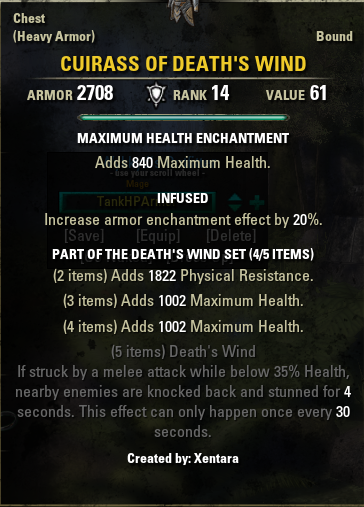 As second set I’m wearing four parts of the death wind set, which boosts health and physical resistance. 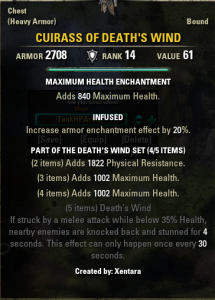 All armor set items have been enchanted with health. Currently I’m using two pieces of the footman jewelry set, mainly to push health and stamina. The jewelry has been enchanted with a mix of reduce „cost of blocking“ and „increase stamina regeneration“.